Oh, how I love Devo. Those little New Wave robots stole my heart back in the last century and just never gave it back. But, as is the way of robots, they have begun to assert their independence and their indifference to human emotions. They have come for our toys! 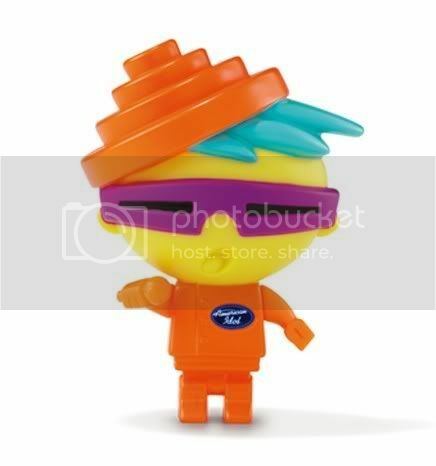 This is New Wave Nigel, one of McDonald’s recent American Idol toys, and according to Devo and their human slaves lawyers, his use of the Power Dome hat and his suspiciously nerdish vocals (yes, he sings) constitutes copyright infringement. Well, there are several issues here, not even counting the fact that Nigel’s performance is a little stiff. 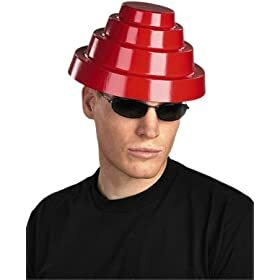 According to the AndyOnTheRoad blog, Devo never trademarked that hat, nor do they have a hegemony on nerdish-sounding vocals; after all, wasn’t that the entire New Wave? “This New Wave Nigel doll that they’ve created is just a complete Devo rip-off and the red hat is exactly the red hat that I designed, and it’s copyrighted and trademarked. [Bassist] Casale said it was ironic the world’s largest fast food chain should appropriate the image of a band known for taking aim at the dysfunction and herd mentality of American society. “The very same people that wanted nothing to do with Devo and looked down on Devo and condescended (to) Devo… enough time’s gone by that they go, ‘Hey, you know those guys are synonymous with what was new about New Wave,”‘ he said. Of course they’re not going to let the matter drop; are they not men? They are Devo! Click here for our Stylin’ Stila Giveaway #2! Hot Mama Tip- Stylin’ Stila Summer Giveaway Number 2! Forgive the Glinda for this late post. Glinda had a long, long, week topped off by a physical ailment that hit her last night at 2am. And no, it was not due to the overimbibing of alcoholic beverages. Then I had a dream where I somehow became the nanny for Brad Pitt and Angelina Jolie. I will spare you the details of both the ailment and the dream. I will tell you the details of our second Stila Giveaway, and the lucky winner of last week’s contest! This week’s contest involves answering a question on your blog to win. You must tell me all about your can’t-live-without beauty product. Post the answer on your blog and link to it in the comment section. Entries can be submitted until midnight (Pacific) July 11, 2008. Unfortunately, this contest is limited to participants living in the United States or Canada only. My handy-dandy random number generator came up with the number 1, and gamma, that means you! Because you are the first to win, you have first choice of the three colors, so email me (just click on my name up there in the orange) for the details!